Rosemary Roasted Sweet Potatoes will steal the show at your holiday table! This easy side dish recipe is healthy and delicious! Have I mentioned lately what an amazing cook my mother-in-law is?! She made these mouthwatering Rosemary Roasted Sweet Potatoes for our Thanksgiving dinner last year and they were a huge hit. I couldn’t wait to share this incredible side dish! Adding fresh herbs to roasted vegetables really makes the dish sing! I adore the savory and sweet flavors of this sweet potato side dish. It’s a keeper for our holiday menu and also makes an incredible side dish for any meal. I hope that you enjoy this favorite as much as we do! If you’re looking for another incredible holiday side dish recipe, don’t miss these easy Slow-Roasted Green Beans! Wash, peel and chop the sweet potatoes into bite-size cubes. Toss with remaining ingredients, except nuts and parsley and you’re ready to roast! Preheat oven to 375 degrees. 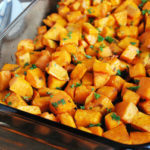 In a 9 x 13 x 2-inch baking dish, combine sweet potatoes, garlic, rosemary, olive oil, salt, pepper and paprika. Toss to coat. Bake for 40-45 minutes, turning occasionally. Just before serving, sprinkle with toasted nuts and parsley.